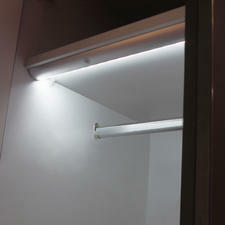 LED Wardrobe lighting is both a great choice for aesthetic and practicality purposes. Often with a big wardrobe, it can be difficult to see all of the contents in detail and having small, LED wardrobe lights fitted on the inside, you can see clearly all of the contents, even if the rest of the room is dark. Wardrobe lights don’t just come in one, plain form - we have a range of different styles available from spotlight style lighting to strip lighting that can literally run in line with the clothing rail inside your wardrobe. 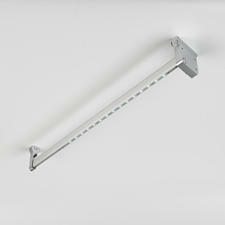 All of the lights are of a subtle, white brightness and are not overpowering - just enough to brighten the area. We have a selection of sensor operated wardrobe lights which are a great energy saving solution, as the lights can be placed inside the wardrobe and will only illuminate when the doors are open, turning off when the wardrobe doors are closed. If you want a practical and convenient solution, you can also opt for rechargeable lighting which is battery powered so there is no hassle with wires getting in the way of your wardrobe’s contents. All of our LED wardrobe lights are of a minimalist and fuss-free design and definitely won’t overpower the existing design of your bedroom or study, rather enhance what you already have. Their aluminium finish gives them a chic and professional feel and due to the subtle, neutral tones of their bulbs, these lights if turned on alone could even provide great mood lighting, creating a cosy ambience. If you are considering fitting lights into your wardrobe, there will definitely be something to suit both your needs and taste, within our range. Whether you are looking for several spotlights to illuminate a large, dressing room type space or whether you just need one single strip of light to brighten up an otherwise slightly dingy wardrobe, we have everything that you need and more – including handbooks and guides on how to fit your lights, all of which can be done easily. With an LED lighting solution for your wardrobe, you are enjoying the benefits of wardrobe lighting at a fraction of the cost of using regular halogen bulbs. Using regular bulbs may prove quite costly due to the excessive amount of energy that they use and may also be time consuming due to having to change them regularly. Our LED fittings have approximately 30,000 hours power time so they are an extremely cost-effective and also hassle-free choice. 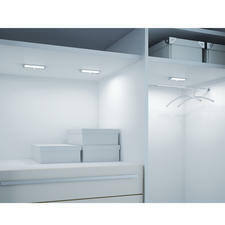 Wardrobe lighting is a fairly contemporary concept and will look fantastic in a bedroom of modern design. However, if you do have fairly dated décor and can’t afford to completely re-do the entire room, our fixtures are also a great and cheap way of transforming and brightening furnishings to give your area a fresh, new and exciting feel.